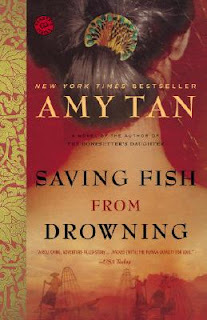 Amy Tan introduces her novel Saving Fish From Drowning with a story from "real life": how she wandered into a New York library to escape bad weather one day and found the material for the book as she passed the time. Or, so many readers thought; later, people began to look into the supposedly true events and people that inspired the novel, and many cried foul when they couldn’t substantiate Tan’s claims. There are websites with comment after comment from readers, lamenting that they feel duped by the author. I‘ll freely admit that I was one of those readers who took the opening story at face value, but I’m more inclined to say “bravo” to Ms. Tan. Having read some of her other work and already knowing what a talented storyteller she is, her “sleight of hand” on the page gives me more admiration for her as a fellow writer. It’s not always easy to draw readers in to your work and interweave multiple plot lines, and Tan’s possibly faux preface does both things exceedingly well. 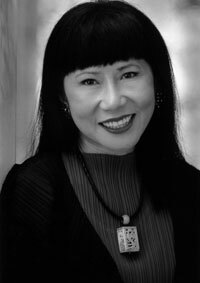 The novel revolves around a quirky socialite and art dealer named Bibi Chen and a group of her well-to-do friends who are planning a holiday time trip to China and Myanmar. After making the arrangements for their adventure and designating herself as tour guide, Bibi dies unexpectedly and mysteriously. Brand new to the afterlife, she still goes along with the group, trying to figure out how to navigate her new existence along the way. Despite Bibi’s sudden passing, her friends go forward with the vacation, justifying it by asserting that Bibi would’ve wanted them to forge ahead. Tan’s use of Bibi as a wacky, unreliable storyteller is pure fun. What follows is a winding, complex comedy of errors that culminates with the group disappearing into a jungle on Christmas Day. Though this isn’t a quick read (it has 474 pages), the commentary from Bibi Chen throughout amps up the adventure. Sometimes sarcastic and always opinionated, Bibi gives us glimpses into the characters' faults, attributes and frailties. It’s through these insights from Bibi that characters who seem a little bit cloying on the surface are given more depth, and we can even empathize. While much of the novel is somewhat light-hearted and funny, political commentary, misunderstandings (and just plain ignorance) of other cultures and beliefs also play a large part in the storyline. There were a few characters that I would have liked to have seen expanded on even more, and some reactions from the characters that seemed rather unrealistic considering the circumstances. All in all though, this novel maintained a perfect record: there hasn't yet been a book from Amy Tan that I haven't enjoyed.